Flight cancellation is a common event and takes place even in the most reputed airlines. The situations and reasons causing flight cancellation are uncontrollable from the part of both flyer and airport staff. But the flight cancellation can turn into a huge fiasco if passengers are not directed towards either a next flight departure or paid out with the refund amount. Do you know how to claim for cancelled flights? Do you know how flight cancellation compensation in India is paid out? 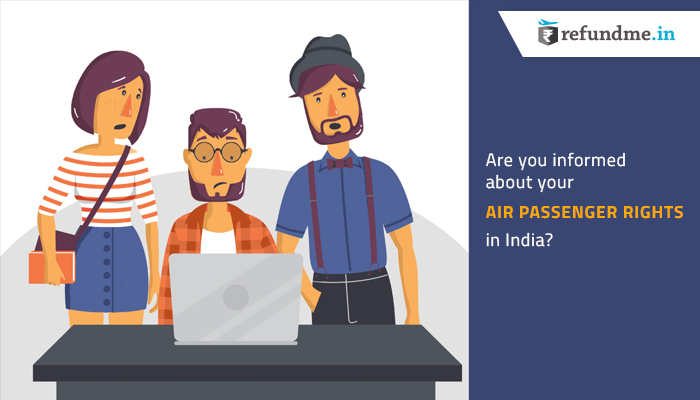 Do you know your air passenger rights entitled by DGCA? If not, worry not as in the following article you will read about your alleged passenger rights in a case when your flight is cancelled by the airline authority. According to DGCA, the passengers have full power to fight for the compensation along with the refund in cases where they are not informed about such cancellations. Let’s dig out in detail the cases and the amount for the cancelled flight compensation. What to do if you are intimated about the flight cancellation? If you are informed about the flight cancellation 2 weeks prior to the departure, in that case, you can demand either a refund or an alternative flight option. Opt whichever is feasible to you. If you are informed about the cancellation before less than 2 weeks or 24 hours of the departure, you can ask for an alternative flight within 2 hours of the scheduled flight. What to do if you are not intimated about the flight cancellation? There are times when airport authority fails to inform about the cancellation and the passengers after all their packing and planning have to face the consequences. The following amounts as flight cancellation compensation will be paid out along with the refund (actual amount of the one-way ticket). If the block time is 1 hour, the redeemed amount will be either of Rs 5,000 or one-way fare plus fuel charges (whichever seems less). If the block time is 2 hours, the redeemed amount will be either of Rs. 7,500 or one-way fare plus fuel charges (whichever is less). If the block time is more than 2 hours, the redeemed amount will be either of Rs. 10,000 or one-way fare plus fuel charges(whichever is less). Note- block time is the total time taken by the aircraft from its designated place to the final destination. When flight cancellation compensation will not be provided? If the cancellation is caused by the extraordinary circumstances like civil war, natural disaster, political instability, cancellation due to ATCs, security risks and the meteorological conditions. In the case where passengers have failed to share their ideal contact information while making a booking, they will be provided either with an alternative travel option or a complete refund. The perks of cancellation compensation will somehow be provided during their wait for an alternative flight. Now you know your air passenger rights in a situation of a cancelled flight. Leave the hassle of a claim for cancelled flight with refundme.in and see those bank digits rising just in time.